The T-54 main battle tank was a formidable combat vehicle that evolved from the combat-proven T-34 with a number of iterations in-between. The T-54 was armed with the rifled 100mm D-10 main gun. After a few initial turret designs that continued to transform the tank profile from the large T-34/85 turret through the T-44 lower-profile turrets and finally the introduction of the domed turret with the early T-54A which eliminated shot traps and provided excellent crew protection from conventional tank ammunition. The T-54A also introduced a gyro-stabilization system for the main gun in the elevation plane. With the transition to T-54B production, the stabilization system had been improved to cover both the azimuth and elevation planes. The early T-54B also introduced night vision equipment in the early production tanks and a more comprehensive night fighting system with the late production T-54B. The T-54 was produced in very large quantities before Soviet fighting doctrine had moved into the nuclear age. Production was transitioned to the T-55 which provided the crew with shielding from various forms of radiation exposure as combat was envisioned in relative close proximity to tactical nuclear detonations. The T-55 also introduced the Nuclear, Biological, and Chemical air filtration systems to keep crews protected inside the tanks. Many T-54s were upgraded to the T-55 standard while others were exported to allied nations where you will find T-54s still in service today. Israel recycled a significant number of T-54 and T-55 tanks captured from combat operations and fielded them as the Tiran series with a variety of modifications and upgrades. 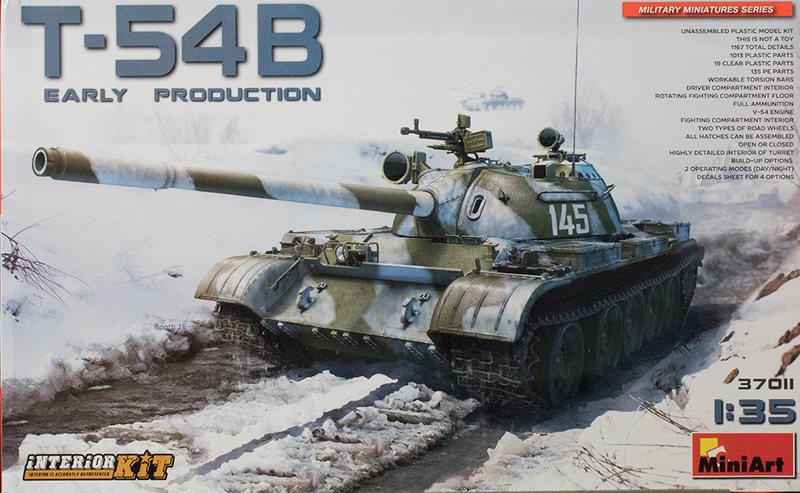 MiniArt has released the long-awaited T-54B kit, this one featuring a full interior and the early production configuration. I remember wanting to build a T-54 and still have the handbook published by one of the AMPS experts on producing a proper T-54 in scale. At that time, the only T-55 tank kit available in 1/35th scale was from Lindberg and it took some work to render an accurate T-55, and even more to backdate the kit to a T-54. Since that time, Tamiya released their own T-55 which remains one of the best kits of the subject though it too requires some work to backdate the kit. 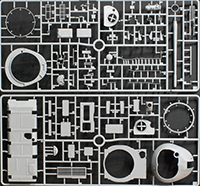 Other T-55 and T-54 kits have more recently become available, but none offer the details, inside and out, that you'll find in this box. The MiniArt kit comes in a sizable box, but when you open the box, you'll find no wasted space inside. When I removed the parts from the parts bags, it was clear that there was no getting this box closed up completely again. You see, there are 89 parts trees (that is not a typo and duplicate trees not shown) molded in gray styrene, plus two trees of clear parts, and one fret of photo-etched parts. According to the specifications, there are 1,167 parts in this kit. While roughly 5% of the parts aren't used in this version, and another 5% that are optional configurations, there is little waste in this kit! Construction begins with the V-54 engine and it is an intricate model of its own right. For me, this kit is the version I've been waiting for as this marks the distinctive shape and profile of Soviet and Russian tanks that remains true today. While the T-54 itself was quickly defeated with the introduction of shaped charge projectiles and other more advanced penetrators, the armor would evolve to counter the threat but the shape of the tank would not change until the introduction of the Armata T-14 tank a few years ago. Even so, the T-72, T-80, and their subvariants still retain their visible shape that started with the T-54. MiniArt continues to turn out some interesting subjects with outstanding details. It is also nice to see that for each of these releases, they give you the choice of a kit with full interior (like this one) or the (almost) empty hull found with most other armor kits at a lower price. Even the empty hull kits still retain nice details in the turrets so you can pose the turret hatches open.